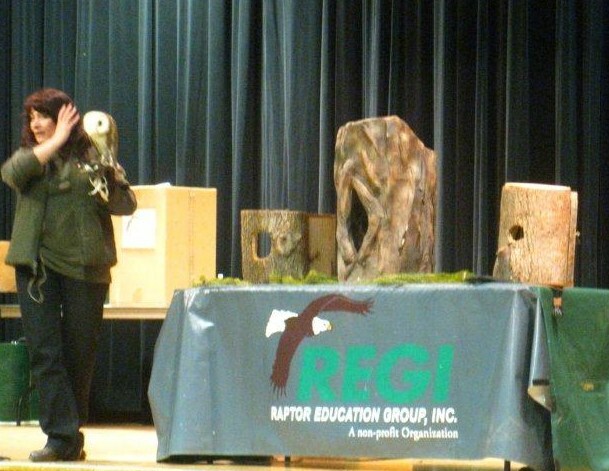 During late February and early March, REGI's educators have been busy attending and presenting at several festivals. On February 20-21 Education Director Steve Fisher and Environmental Education Coordinator Molly Mckay staffed a REGI display at Klondike Days in Eagle River, WI, featuring some of our education birds, or, as we often refer to them, our educational "partners." Helping Steve and Molly educate interested members of the public at the two-day festival were our twenty-year-old "veteran" Red-tailed Hawk, our young Great-Horned Owl, a Peregrine Falcon, two Eastern Screech Owl, a Barred Owl (who is also a fantastic foster parent), and our Barn Owl, who helped demonstrate habitat as he perched comfortably in his tree cavity display. There was a steady stream of people who stopped by the REGI booth, asking lots of good questions, as well as discussing serious issues like lead poisoning and other problems for raptors and all birds of prey. 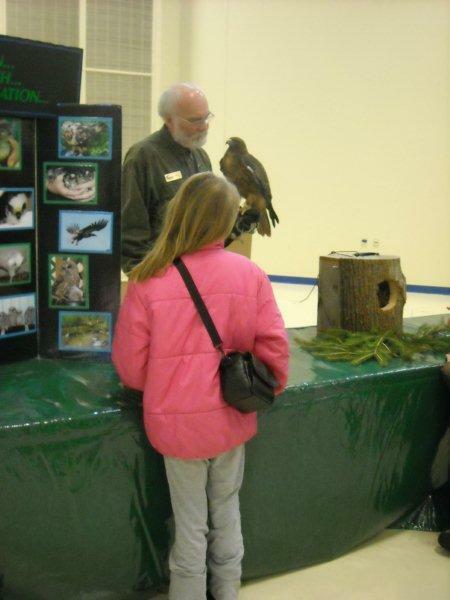 Steve and Molly (and the birds!) 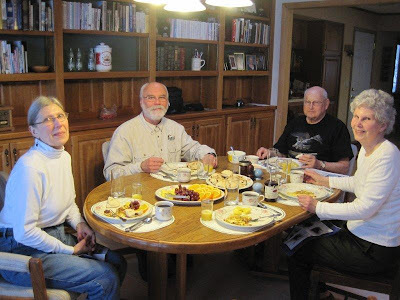 were very busy each day but were happy to interact with so many supportive festival visitors. On March 6-7 Marge, Steve, and his wife Evie headed to the International Festival of Owls in Houston, MN, where REGI presented a program to several hundred people about native owls. 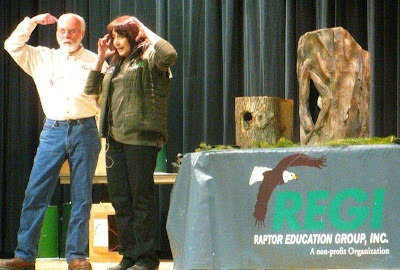 Marge shared lots of fascinating owl information with the audience, as Steve and Evie walked the owls through the auditorium, giving everyone a close look at our beautiful Great-Horned Owl, Barred Owl, and Eastern Screech Owls and our famous Saw-whet Owl. After the program, audience members headed up front for more close looks and chances to ask questions. 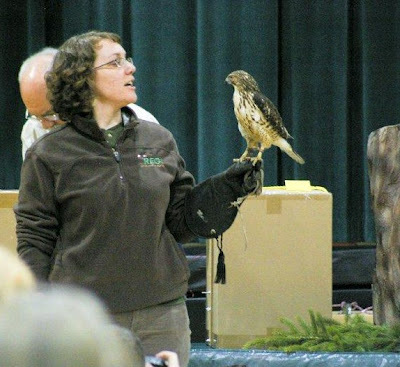 That evening Marge was the keynote speaker at the Owl Festival banquet, giving a talk entitled "Owls: Personal Stories of Wonder and Inspiration." Using both projected images and personal stories from different times in her life, Marge captivated the audience by sharing her knowledge and passion for birds, with special emphasis on owls. 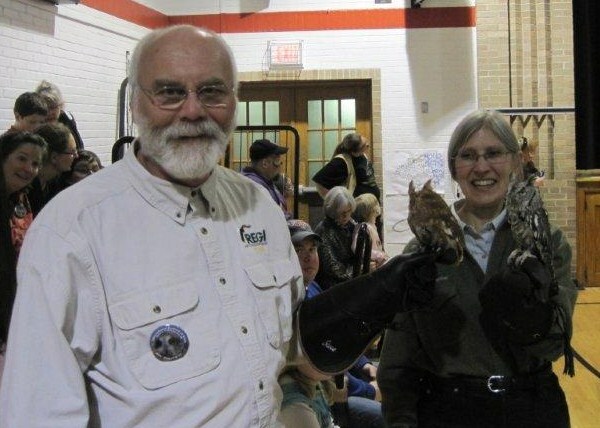 The following weekend, March 13-14, Steve, Evie and Molly were back in Minnesota, this time at the National Eagle Center in Wabasha, MN, as part of a special eagle weekend at the center. 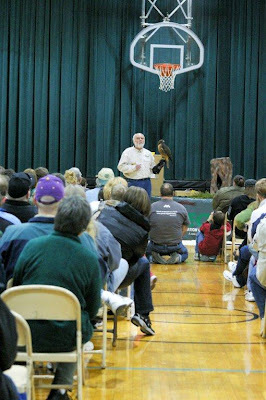 Steve and Molly presented hour-long programs each day to large audiences and also brought out the education birds for photography sessions, both inside and outside in the sunshine along the bank of the Mississippi River, as wild Bald Eagles soared and danced in the sky above them. 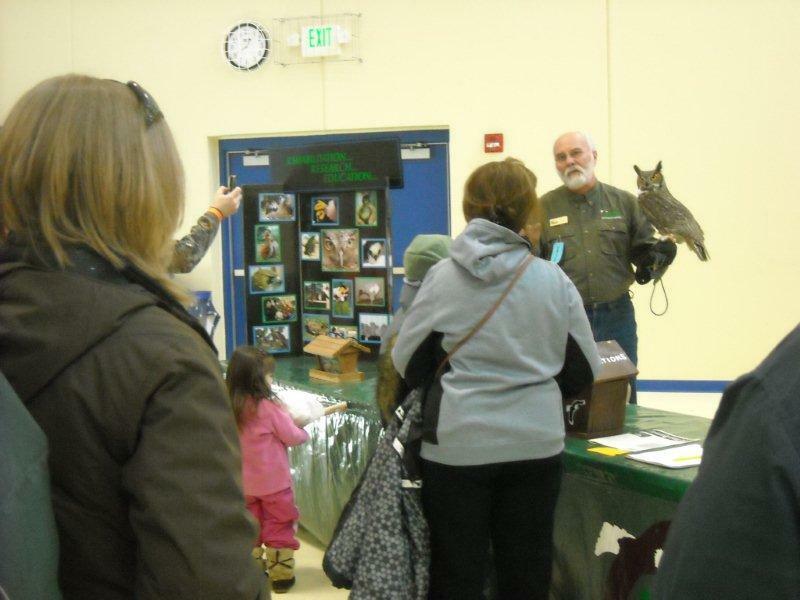 At each of these festivals and special occasions, we met wonderful people who showed genuine interest and concern for birds and the many important issues that affect them. It is gratifying to know that our education raptors, who can't be out in the wild, live worthwhile lives and are such magnificent and effective teachers. 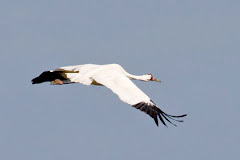 It's so good to see them help in a unique, up-close way to show how and why protecting them and solving the problems that affect them matter to all of us.